Not only do you get to catch up with family and friends, but you get to eat awesome food too. It is the best meal of the year. Slow roasted turkey, sweet corn and mashed potatoes are great, but no Thanksgiving meal would be complete without stuffing. Any good cook knows the perfect stuffing needs thyme. The thyme used in cooking comes from Thymus vulgaris. The oil of thyme can also used be in aromatherapy. 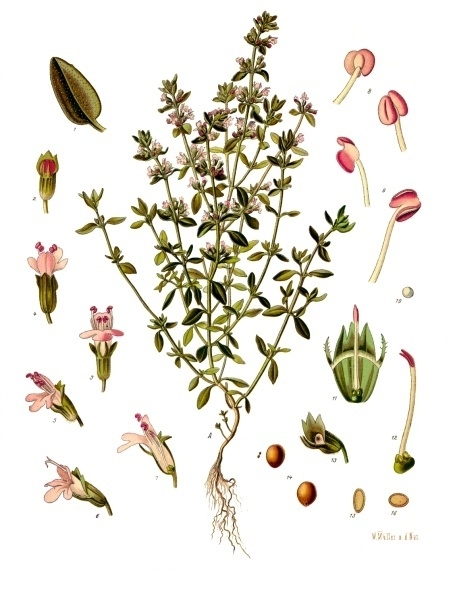 Thymus vulgaris is a small, perennial herb. The word Thymus comes from thymos, the Greek word for courage. In ancient Greece, thyme was symbolic for courage. Even Romans associated thyme with courage, warriors would bath in water infused with thyme in order to gain strength. Vulgaris means common in Latin. One of the common names for Thymus vulgaris, common thyme comes from this translation. Other names for Thymus vulgaris are garden thyme and english thyme.